Get More For Your Money With An Intimidator Side by Side | Intimidator Inc.
Gone are the days when all-terrain vehicles were used merely for the hauling of junk around your backyard and off-road construction sites. Many people have turned these little workhorses into one-seated recreational vehicles for making tight turns and racing with friends. It’s only natural, then, that the atv has been all but replaced by the more robust and capable utv, find out why the Intimidator side by side are the best utv for your money. Why Should You Buy An Intimidator? ATV vs UTV: WHAT'S THE DIFFERENCE? An affordable and quality utv has both size and storage space over the single-seat atv. In fact, not only can these utility vehicles carry your camping gear in the back, the come in models as large as the 4x4 side by side option. That means a small family can ride along in this compact, powerful option by Intimidator, Inc. Of course, Intimidator utvs also come in two-seater options. There’s nothing like the pride that comes along with homemade, trusted construction. 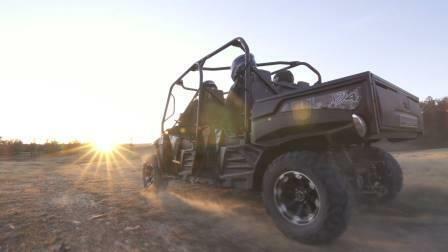 All Intimidator utvs are manufactured using American made steel, fashioned by American hands and equipment. That means, ultimately, you’ve got the stamp of American approval in all the aspects that matter – safety, performance and satisfaction. Instead of buying one atv for every member of the family, or even just two between friends, you can spend less on a single affordable American-made utv to safely transport your loved ones in almost any off-road environment. Despite the drastically-reduced size when compare to the standard truck, the utv is quite capable of carrying your luggage in a secure back-of-the-vehicle compartment. Trek to your favorite hunting spot that was always off-limits to large trucks, or inconvenient to travel without a friend. Your gear is safe in the back, so you can set-up, camp and hunt with everything you need once you arrive. Intimidator offers a Crew Cab model, an Intimidator Truck model and an Intimidator Classic utility vehicle. If you live on a farm, you’ll look for every opportunity to drive feed out to the stable in your new cab. Come and check out our selection of the best side by side utvs and get in early on a growing aftermarket. Intimidator stands by the product fully – it was made with good old-fashioned American skill and desire, after all. Check out our side by side comparison guide here!